Total Rewards can be described as the “tool kit” from which an organization chooses to offer and align a value proposition that creates value for both the organization and the employee. Total Rewards includes programs and practices that affect the organization’s ability to attract, motivate and retain employees. In some organizations, Total Rewards includes other activities such as performance and recognition, and development and career opportunities. In the TDRp framework, performance and recognition measures appear under the Performance Management process, and development and career opportunity measures are captured under the Leadership Development, Learning and Development, and Capability management Processes. In practice, each organization is free to organize their human capital activities any way they choose. We simply need a framework to organize the measures. Each key process like Total Rewards contributes to the achievement of organization goals (for example, a 10% increase in sales or a 15% increase in productivity) and talent outcomes (for example, a 5 point increase in employee engagement or a 2 point increase in the retention rate). Often, talent outcomes are top-level goals of the organization on par with an increase in sales or a reduction in costs. Other times, the talent outcomes are viewed as intermediate goals in support of achieving the top-level goals. TDRp is designed to work in either case. More than 100 measures are defined for Total Rewards. These measures are grouped by type of measure (efficiency, effectiveness, or outcome) and across six subcategories. Each organization should choose the measures most appropriate to achieve their goals and manage their human capital. 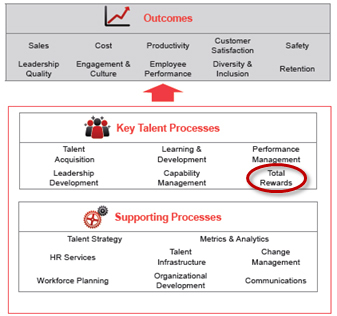 Total Rewards will typically support the broader organizational goals, as well as talent management focused goals. A short summary of each Total Rewards subcategory, including examples, follows. Compensation – measures regarding employee compensation. Variable Compensation – measures regarding the variable components of employee compensation. Pay for Performance – measures that calculate the differential pay earned by high performers. Benefits – measures related to the benefits provided to employees. Labor Cost – measures that capture both compensation and benefits. Employee Equity – measures quantifying employee equity plans. In addition to being grouped by TDRp category (efficiency, effectiveness, outcome), the measures have also been grouped into Tiers, which are described below. Tier 1: These are typically going to be the Key Performance Indicators (KPIs) of a given Talent Process. They are likely to vary from one organization to the next and some “Tier 2” metrics may indeed be key to one organization and “Tier 1” metrics for them, while not for others. At a minimum, “Tier 1” metrics are a list of starting-point, TDRp suggested metrics for those looking to build measurement in a given Talent Process. Tier 2: These are typically going to be the supporting metrics for a given Talent Process, which one might look to in order to determine why any noticeable changes or trends in KPIs might be occurring. Click here for a complete list of measures for Total Rewards. 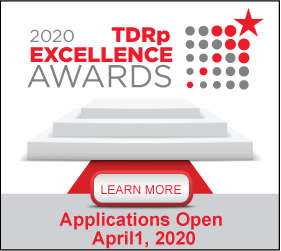 CTR members may also access the full electronic version of the TDRp Total Rewards Measures Library, which provides definitions, formulas, comparable measures, and complete references to source documents for a detailed discussion of each measure. These statements and reports are provided as a starting point in your understanding and application of TDRp. We know each organization is unique and will need to select its own measures, but the templates have proven valuable to the early adopters. The white papers Introduction to TDRp and Extending TDRp to All Key Human Capital Processes are highly recommended. Since the TDRp initiative began with a focus on Learning & Development, more has been written for L&D than for the other key processes. The Tips and Tools for L&D, however, will also be helpful for understanding how to construct the various statements and reports for Total Rewards. With time, advice pieces will be written for each key process. Notes: (1) The other five key human capital processes are Talent Acquisition, Learning & Development, Capability Management, Leadership Development, and Performance Management. Workforce Planning and Demographics has also been included as a key supporting process. For more on the TDRp framework see Introduction to TDRp and Extending TDRp to All Key Human Capital Processes .